Rockin’ all week with you. We're quoting the well-known theme song to the popular 1970s sitcom about the 50s, because the Happy Days slot game apparently doesn't have the rights to the tune and instead throws some generic rockabilly soundtrack at us. Which characters are in the Happy Days slot game? Several old favorites are among the character set, including Arthur "the Fonz" Fonzarelli, Richie Cunningham, Joanie Cunningham and Charles “Chachi” Arcola (as portrayed by current-day right-wing fruit loop Scott Baio; so much for childhood TV memories). We really have absolutely no idea why the poker-card symbols are included here, when TV stalwarts like Warren “Potsie” Weber, Ralph Malph, Delvecchio and especially Howard ‘n’ Marion Cunningham all get stiffed. Ah well. 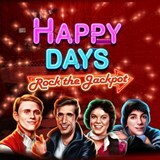 How does the Happy Days: Rock The Jackpot slot play? The HAPPY DAYS logo is a stacked wild. The jukebox is the scatter and the gold record (or “golden record” as the game designers would have it) is a special bonus symbol that pops up during the either five free spins triggered with the landing of three scatters. Revealing the gold record in this round wins a progressive jackpot bonus of at least $50,000. Nice. Even nicer? Imagining that win in 1959 dollars, the equivalent of over $400,000 today. 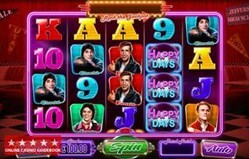 Any sequels to Happy Days slots coming soon? One would think it’s inevitable in a time of endless cultural navel-gazing reboots and remakes. As stated previously, many characters from the Happy Days TV series didn’t make the cut; you could easily design a Happy Days-themed slot game with those not included here. A “Joanie Loves Chachi” slot is essentially hinted at herein, and at least two other Happy Days spinoffs seem obvious choices for the online casino milieu: Laverne & Shirley and Mork & Mindy. Obvious, really. Thank you and please send me the royalty check c/o this website. These days are ooooooooooooooooo-ooo-o-o-ours, spend them with me….